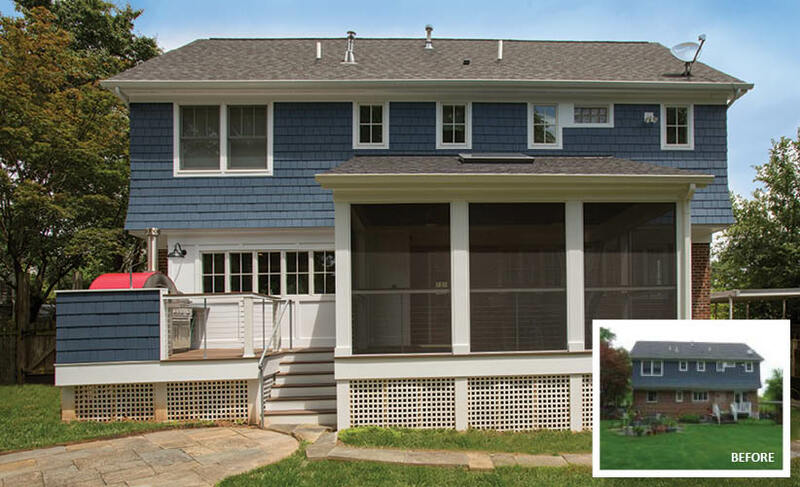 An interior remodel and screened porch addition to a fifty year old home in north Arlington generated a lot of buzz this past September when locals had a chance to view the makeover for the first time courtesy of an Open House sponsored by Sun Design Remodeling. The changes to rear elevation rooms incorporate a new gourmet kitchen almost 40% larger than the previous galley design. The revised space, in turn, segues to a screened-in porch and grilling deck that features garden views and an al fresco dining venue with rotating fans, a skylight and even a pizza oven. Chris and Cynthia Heimann, who have occupied the home for 16 years, have found the new plan a boon to everyday life—and perfect for entertaining. According to Craig Dursoko, Sun Design’s founder and chairman, the Heimanns initially considered building a new addition, but the remodeler asked them to also look at an alternative approach which would entail re-configuring living space within the envelop of the existing home. “The Heimanns had actually upgraded the kitchen a few years ago, but the stairwell connecting the first and second floor took up over 12.5 square feet of front-to-back floor space restricting the kitchen’s width to about ten feet,” Durosko recalls. The home’s southeastern corner, however, was occupied by a mostly unused home office accessible via a short hallway with a powder room off to one side. These rooms absorbed over 100 square feet of floor space and (importantly) did not abut the staircase. Measurements in hand, Durosko and team saw an option of relocating the kitchen to the opposite side of the rear elevation. “There were lots of infrastructure considerations, but—as a space plan—the move made sense,” the remodeler recalls. 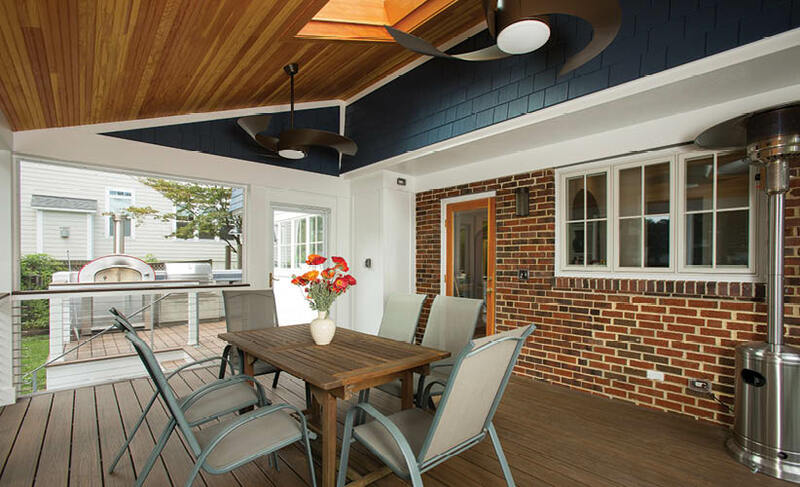 Searching to better rationalize the home’s first level, lead designer Clare McCaffrey saw early-on that achieving the scale and symmetry appropriate for the new dining porch would entail moving the rear access door to a spot in the middle of the rear elevation. 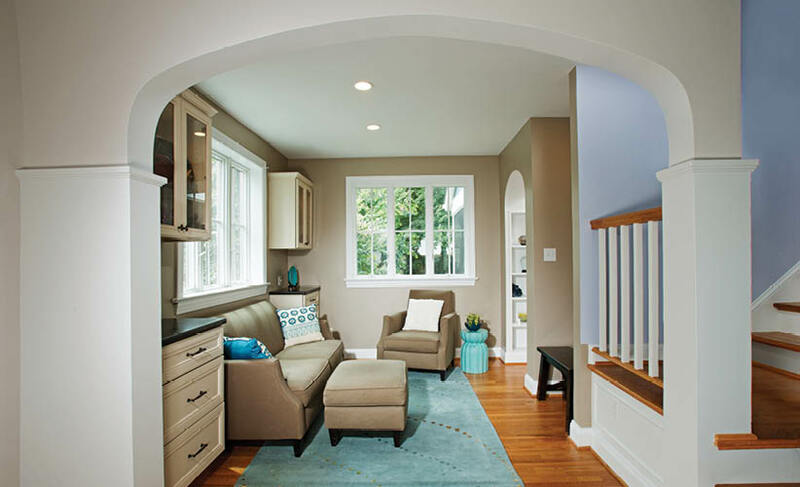 This in mind, McCaffrey developed plans for a corridor between the sitting room and the new kitchen which would also accommodate the relocated powder room. With a course of casement windows assuring abundant natural light, and custom-designed built-ins displaying art books and collectibles, the hallway is a natural adjunct to the sunny reading room that formerly provided a rear access door. Moreover, aesthetically, the new room is entirely compatible with the more nuanced and articulate interior design scheme that is explored throughout. Homeowner Cynthia Heimann, who is a commercial architect, was especially pleased with the collaborative input of both McCaffrey and specialty designer Morgan Hutchinson. 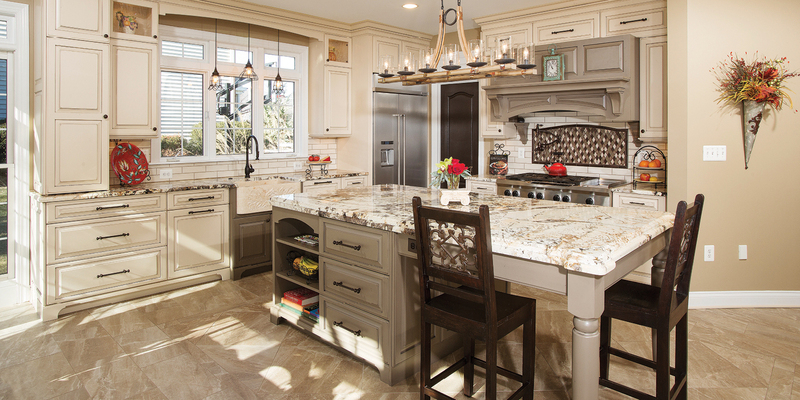 The food prep island and dining counter, which includes a cook-top range, a sink and seating for three also provides cabinetry for china and crystal ware. 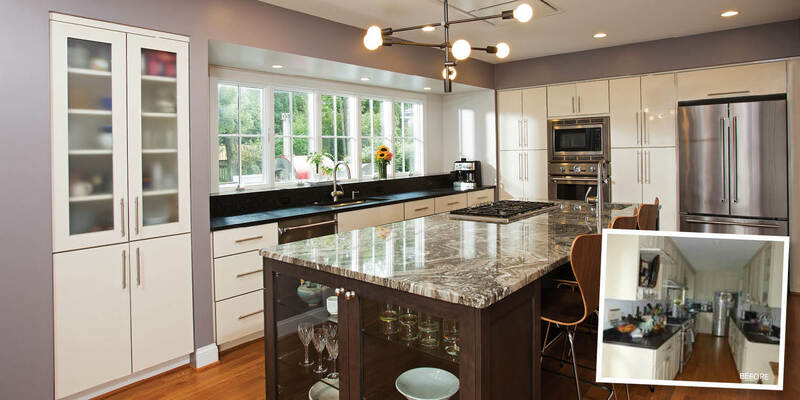 The frameless acrylic cabinets in combination with gray wall paint further reinforce understated elevations in which small variations in color and texture stand-out. An eye-catching pattern in the Avalon marble that surfaces the island was cut out of a larger slab specifically for this application. Likewise, the honed granite surface around the sink helps anchor the color scheme. On a related note, Hutchinson makes a reference to the elliptical archways in the home’s front rooms via the unique niche she created for displaying a framed poster the couple had purchased in France many years ago. 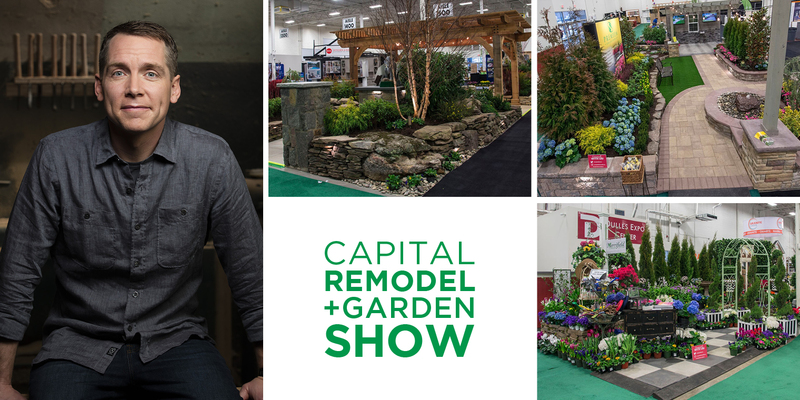 Sun Design Remodeling frequently sponsors design and remodeling seminars as well as tours of recently remodeled homes. 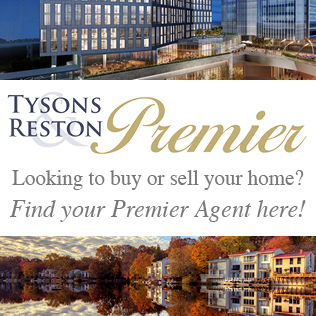 Headquartered in Burke, Sun Design also maintains an office in McLean, VA. For information visit www.Sun DesignInc.com, or call 703-425-5588. 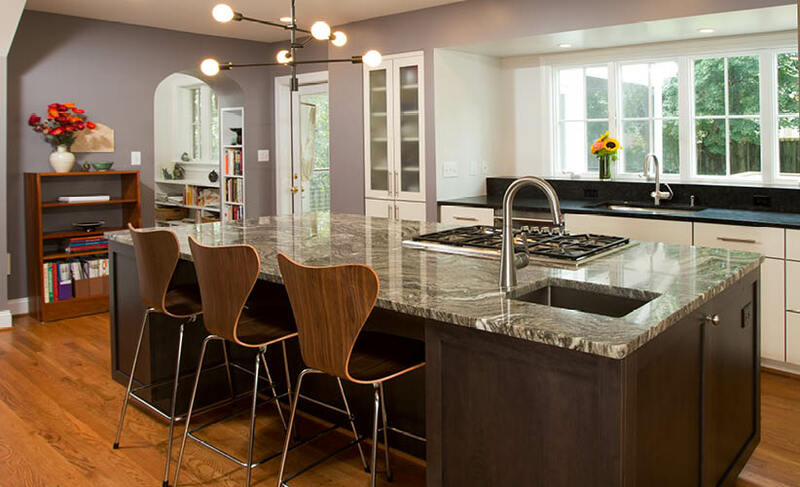 Kitchen table island rear view: By re-purposing adjacent back rooms to 50-year-old Arlington home, Sun Design Remodeling accommodated a gourmet kitchen 40 percent larger than its predecessor. 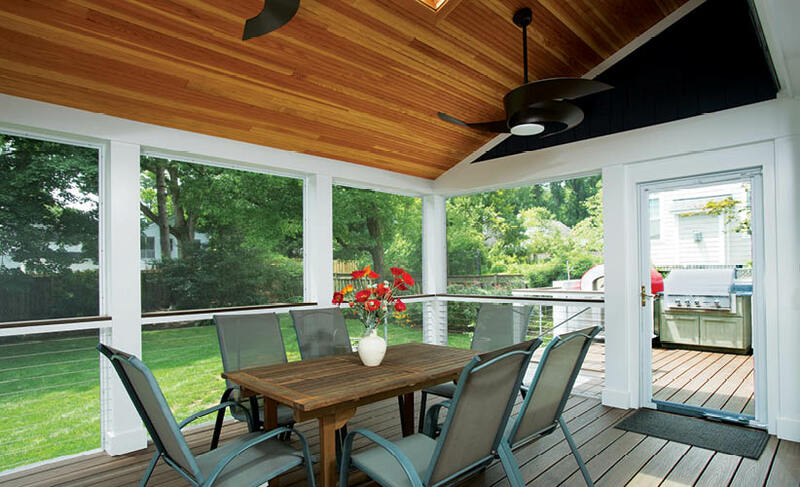 The plan segues to a new screened-in porch linked to a grilling deck. 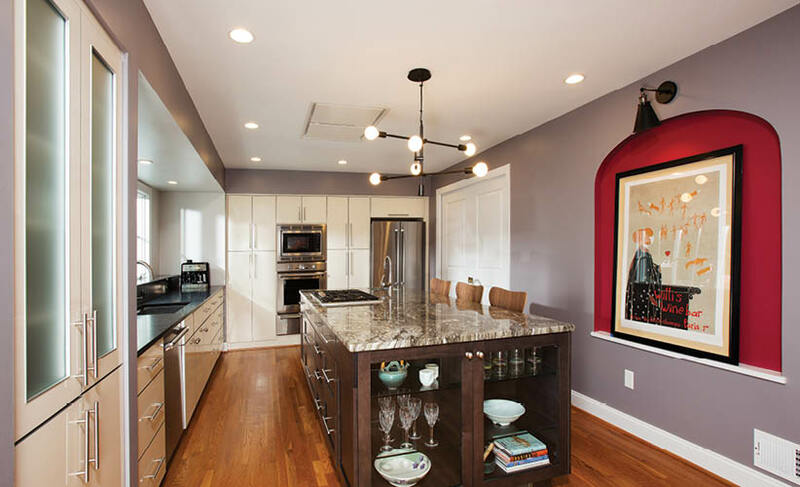 BEFORE Kitchen: The former galley kitchen was too narrow to allow more than one cook at a time. The owners had considered building an addition, but Sun Design’s Craig Durosko showed the couple how to accomplish their goals while staying within the envelop of the existing home.